"Stackable Grandmother's Name Rings, Silver , Set of Two Single Stack Rings"
This personalized set of two grandmother's name rings are simple yet meaningful. As you have more grandchildren, you can stack more rings! 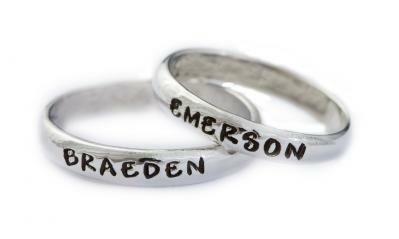 This set of stackable Mother's Name Rings are a precious gift for the grandmother of two. Customize with a name on each ring and stack them on your finger. Our single band is simple and sophisticated. It is a great add on ring if you have ordered a double or triple in the past and then have another child. This single band looks good stacked with our double, triple or our birthstone rings.